How do you get everything done? That’s probably the most common question I’m asked about homesteading. Time management on the homestead really is not any different than time management in professions that are characterized by a fair amount of unpredictability and lack of control. We could argue for hours about which one is more unpredictable and uncontrollable — the weather or the stock market or employees or animals or squash bugs. Running a homestead, whether for self-reliance or profit, is very much like running a business. We started our homestead because we wanted to grow our own food organically. For the first few years, it felt like we spent a lot of time putting out fires. We had not owned our first horse for more than two days when he escaped from the pasture and led us on a mile-long chase. Goats escaped and killed young fruit trees. The barn flooded. A sheep ran into the road and was hit by a car. Although many of our initial problems were caused by ignorance, some were caused by poor time management. As Steven Covey always said, if you don’t take care of what’s important, it will eventually become urgent. 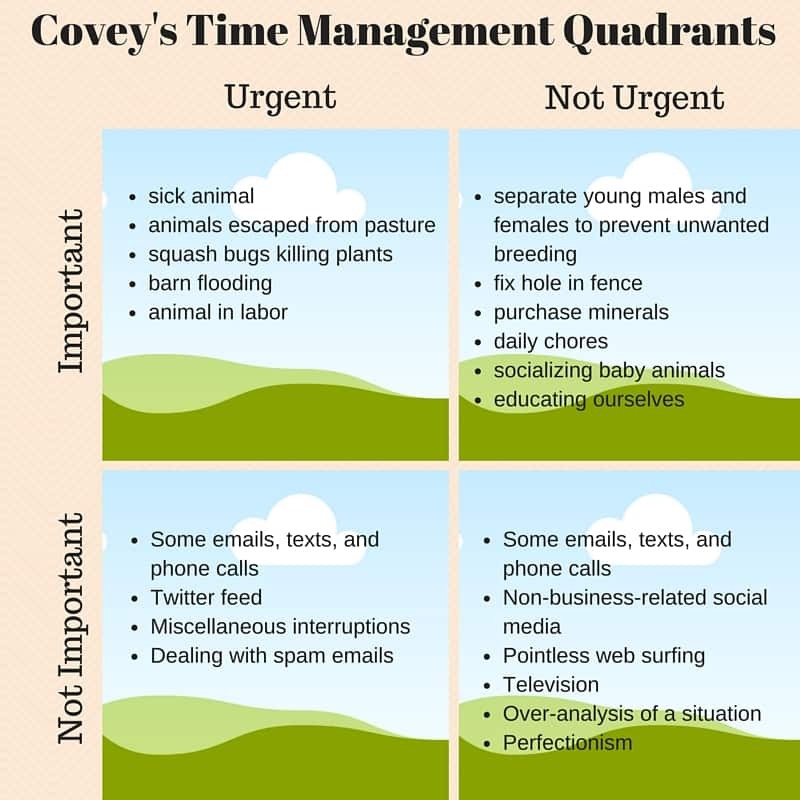 We should be spending as much time as possible in the “important but not urgent” quadrant. If we keep our fences mended, we won’t have animals escaping. If we educate ourselves about animal nutrition and provide proper food and minerals, we are less likely to have sick animals. If we socialize baby animals, it will be easier to handle them as adults. Make a list of what needs to be done. The to-do list has been around forever. A couple of decades ago I started using a Franklin Planner. It was a huge improvement over an old-fashioned to-do list, which is often written on a random scrap of paper. The Planner kept everything organized in a notebook. Prioritize tasks. In addition to listing your tasks, the Franklin Planner had the user prioritize them starting with the most important tasks first. Don’t do anything in quadrant 4 (not important or urgent) unless you finish everything else first. A few years ago I gave up the Franklin Planner because it seemed way too big and clunky. I thought I could use one of the calendars or list apps available on my smart phone. I was wrong! For the past few years, I’ve muddled along with to-do lists written on a yellow note pad. I have tried various calendars on my phone or computer, as well as list or note apps. About six weeks ago, I heard about Nozbe and decided to give it a try. It has been a total game changer for me. I am once again as productive as I was when I had my Franklin Planner. In fact, I love it even more than the Planner. Why? You have an “Inbox” for general tasks, plus “Projects” files. If you mark anything with a star, a copy automatically goes into your “Priority” folder. You can tag tasks with something like “phone call,” and then you can look at all of your phone calls that need to be made for the day, regardless of what project they are in. It works with Evernote, Box, Dropbox, Google Calendar, and Microsoft or Google documents. It syncs with my smart phone. Whenever I think about something that needs to be done, I can add it to my task list, regardless of whether or not I’m in front of my computer. 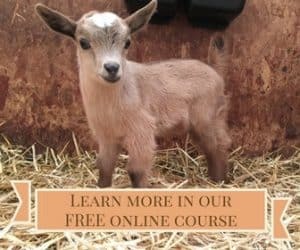 They have short training videos to get you started. I’ve tried a number of different productivity apps, and none provided such excellent training. Their videos are very short. Each one teaches you a few things about using Nozbe and suggests that you take a few days to do that before moving on to the next one. After watching the first training video, I got my inbox down to 0 unread emails for the first time in five or six years! Because of Nozbe, my inbox stays at 0! It used to have 200+ emails in it, so this is a huge benefit for me. Everyone says to get your inbox down to 0, but before Nozbe came along, I had no idea how to actually do that without forgetting to respond to people. Email management and time management go hand in hand. Nozbe has a free version, which would work well for most people. If you have a lot of projects or want to add team members, you can upgrade to their Pro version, which is $8 a month. Not sure which is right for you? You can try Nozbe Pro free for a month. Click here to claim your free month of Nozbe Pro or just to learn more. This blog posts contains an affiliate link. If you click on it, Thrifty Homesteader will earn a small percentage of what you purchase, and you’ll actually save 10% off the regular price. 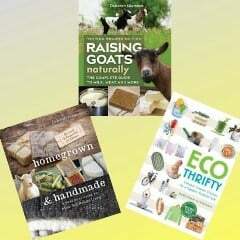 Thrifty Homesteader only endorses products and services that we actually use and love.